Not everyone is blessed with a perfect smile. If you have always been unsatisfied with the way your smile looks, and think that the ratio of gum and teeth that shows when you smile could use some improvement, crown lengthening is a procedure you should look into. Are Your Gums Aging You? It’s not just lines and wrinkles that make you look older, and you wouldn’t normally think gums can age you, but they totally can! A gummy smile can occur with the aging process, so when there is excessive tissue on your top gums, it makes your teeth look short and worn down – typically seen in older people. It can also make you lips appear thinner, another sign of aging. Removing as little as one to two millimeters of tissue so that more teeth show than gum, makes a big difference, making one’s smile look more youthful. Crown lengthening is a minor surgical procedure: Excessive gum tissue can be trimmed away in a relatively fast—15 minutes to an hour—procedure (a gingivectomy) to reshape your gum line with minimal pain. 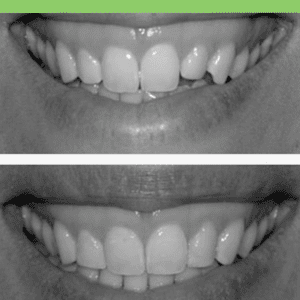 Specifically targeted to improve their health and appearance are the front upper teeth. It involves a periodontist (gum specialist) using a scalpel or laser to trim away a small amount of gum tissue at the gum line, exposing more of the crowns. In some cases, small areas of bone are also removed to achieve the desired results. As suggested by the name, crown lengthening usually involves reducing the amount of gum and increasing the area of teeth that your smile exposes, but it can also be performed to improve symmetry. If the problem goes beyond excessive gum tissue to dental alignment problems, or with jaw size or position abnormalities, orthodontic treatments (braces) or orthognathic surgery may be required to correct the problem. These abnormalities may affect not only your facial appearance but also your bite, speech, and/or chewing. Braces correct dental abnormalities like crooked teeth and poor bites (malocclusion). However, irregularities of jaw size or position can only be corrected surgically. Crown lengthening is performed under local anesthesia. The surgeon will first use small incisions to cut open the gum tissue above your teeth. Tissue will be removed and, if necessary, small portions of jawbone covering the crown. After the gum tissue has been removed, your surgeon will rinse the area with saline and then suture the incisions closed. If you are interested in cosmetic gum surgery in Costa Rica, fill out the “Find a Dentist” form on this page. One of our patient advocates will reply to your needs.